Check out my recent Standing Desk Stretches Exercise Video with yoga-inspired desk stretches. Do them throughout the day to help you maintain good posture and relieve joint and back stiffness. I promise you’ll instantly feel a little better! ide effects – so Ive learned how to stretch at my standing desk to help my body feel its best. 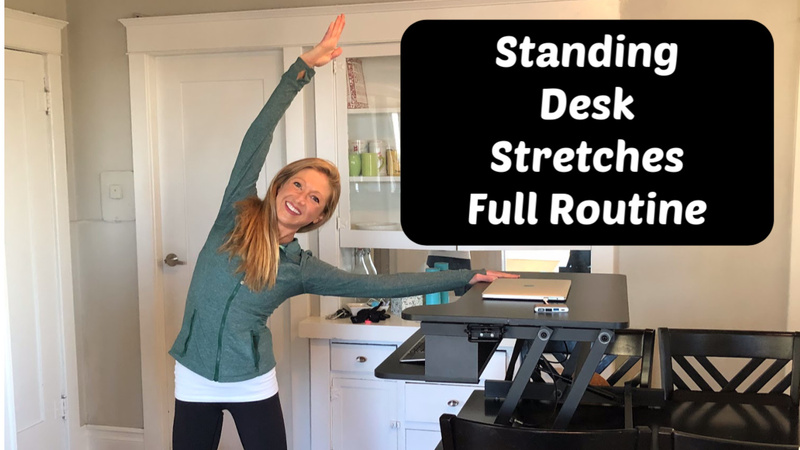 This video routine of standing desk stretches is perfect if you want to continue to use your standing desk and help you body feel its best. This standing desk makes it so easy from sitting to standing in one easy smooth motion with dual gas spring force. It allows me to adjust to my comfort level with a simple touch height locking mechanism. The best part was there was no assembly required and I was able to use it right out of the box! There are many reported benefits of using a standing desk. Reduced risk of obesity, reduced risk of type II diabetes, reduced cancer risk, less physical aches and pains, among many others. Experts report that people who use standing desks are more likely to burn more calories and move more than those who sit to work. Standing for long periods of time may cause back, leg, or foot pain, instead of relieving it. I had a significant amount of foot pain from using my standing desk 24-7. So Ive now learned to alternate between standing and sitting to help my body feel its best. I like to tell my coaching clients, everything in MODERATION. If you’re going to start using a standing desk, split your time between standing and sitting. The easiest ways of accomplishing this are either using a desk that can be raised upward (like my Casiii desk) or a tall chair that you can pull up to your desk when you do need to sit. It’s also important to ease into it, by standing for just a few hours a day at first while your body becomes used to the strain, and move around a bit, by shifting your position, pacing, or even dancing as you work. If you’ve recently started to use a standing desk, here are a few great exercises to keep your body feeling its best while you work. How do you feel after those standing desk stretches? Id love to hear if you use this simple video routine at the office or while working to improve your wellbeing. Please share and KEEP moving! I really think the bigger issue here is just inactivity. So no matter if you choose to sit or stand what’s most important is that you take regular breaks to exercise, stretch, and MOVE your body. Don’t stay stuck standing or sitting at work. Make it a goal to move your body every hour with some simple standing desk stretches or my seated office exercise video. Did you try this standing desk stretches video? Let me know if it helped you by leaving me a comment below. And by all means, share this standing desk stretches video with your co-workers! You can help your colleagues stay healthy and pain free. I offer corporate wellness workshops, presentations, programs, and events. 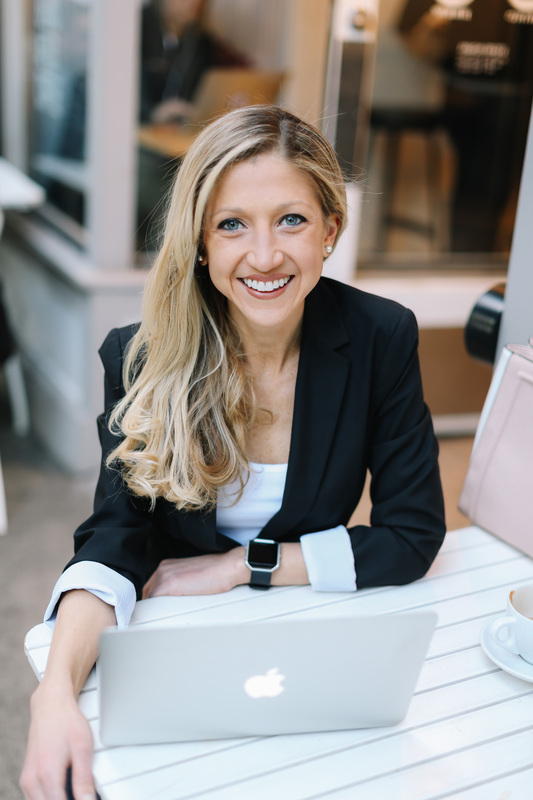 To join the work wellness revolution and bring health to your team, contact carolinejordanfitness@gmail.com for corporate wellness workshops and offerings. I hope these standing desk stretches help fuel your journey for fitness! Keep moving my friends. Seated office exercises for energy.